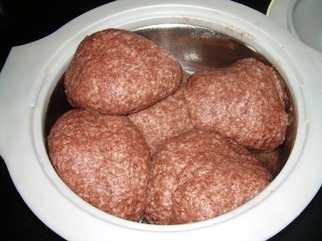 Ragi Mudde (Finger millets balls) is a popular item in Karnataka cusine. It is highly nutritious and gives good strength to the body. Once I had tasted this from my friend's house and since then I have been thinking of making it at home. When I told my maid about teaching me to make ragi mudde she was flabbergasted, and finally agreed to teach me. Keep a big steel vessel on the stove with the above mentioned water to boil. Add the broken rice and cook for some time. Add the ragi flour slowly to it and do NOT stir it to mix in the rice and water. Do NOT close the lid. After about 5-7 minutes, gently push the dry flour down with the spoon so that it is covered with liquid. Do not mix it and stir it. Cook it for another 5-8 minutes on a slow flame, and a nice aroma comes out. Remove from the fire and bring the mudde vessel down. Sit on the floor, keep the vessel in between your feet and stir the contents and mix well with an wooden spatula (mudde kolu)until the mixture is completely mixed. The mixture will be still hot. Take a small plate with smooth bottom and place a bowl of the mixture on it. Dip your fingers in the water and just make a ball of the mixture turning sides, (approximate size of a tennis ball) dipping your fingers once again in the water, and make a ball out of it, and place the ball on a plate. Make balls with the remaining mixture, in the same way, when the mixture is still warm. The raagi mudde can be eaten with sambar, or any other gravy. Take out a small piece of mudde, dip in gravy and gulp it, without chewing it, to get the best taste. Ragi Mudde can be made just with ragi flour, without adding rice. This will be little hard and some may not like the dark color.